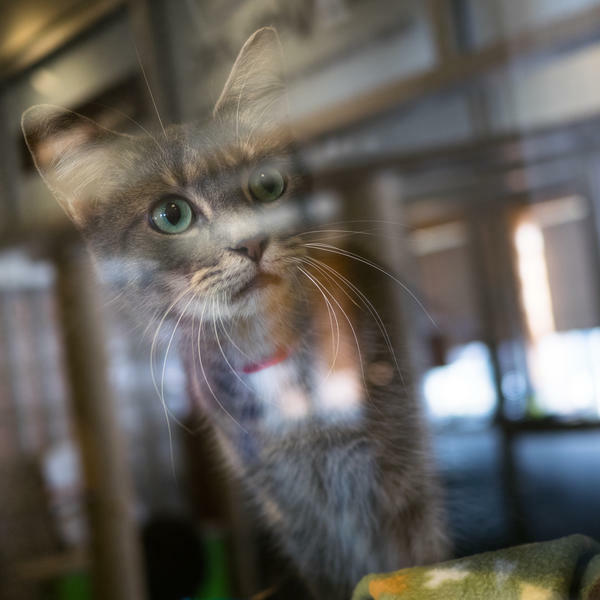 Each year, 3,000 to 4,000 cats are adopted through the Humane Rescue Alliance, and another 1,000 ferals are trapped, neutered and released in Washington, D.C. Cat lovers have joined up with bird lovers to count the feral cats in the city. "We are team science," says Dan Herrera, a field technician with the D.C. Cat Count. Camera traps like this one are strapped to trees and motion-activated. 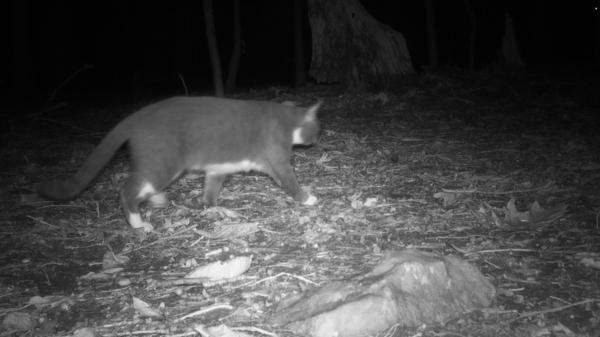 A stealthy feline stalking through D.C.'s Rock Creek Park is caught on a wildlife camera. It's the first cat detected by researchers working on the D.C. Cat Count. It's team cat vs. team bird, and it can get ugly online, with terms like "fake news" and "alternative facts" bandied about in blog posts. But on a recent morning, members of those two opposing camps were working together, navigating a densely forested part of Rock Creek Park in Washington, D.C., by GPS. "We are team science," says Dan Herrera, one of three field technicians working on the D.C. Cat Count, a $1.5 million project that will run through 2021. Two of the techs work for the Humane Rescue Alliance (team cat), and one works for the Smithsonian Conservation Biology Institute (team bird). Both groups say there's a lack of hard data about outdoor cats, making it difficult to have an informed debate about their impact on birds. "I have fed a colony of feral cats myself for about three years now and I just love cats," says field tech Justin Belsley. "So I'm the cat lover representative of the team." Mike Cove, with the Smithsonian, is the bird lover on the team. He's a wildlife biologist who has studied the negative impact of feral cats on birds. He explains the team is counting outdoor cats — strays, feral, and pets — using the same methods scientists use to study much larger animals. "Tiger researchers have been doing this for two decades," says Cove. Tiger researchers set up wildlife cameras, take thousands of photos, and use the photos to identify individual animals based on their stripes. "We're doing the same thing, we're just working with much smaller tigers, presumably occurring at much higher densities than true tigers," says Cove. As many as 4 billion birds, mostly native species, are slaughtered each year by free-ranging domestic cats in this country. That was the conclusion of a 2013 study of the effect of outdoor cats on bird populations in the contiguous United States. It's been frequently cited since by bird lovers. On a recent bird walk with the D.C. Audubon Society, conversation turned from blue jays, cardinals and woodpeckers to the threats facing such birds. Dana McCoskey was leading a group of birders. "It's hard to talk about. A lot of people are only now understanding that their beloved cat can be a cold-blooded killer," McCoskey tells the group. She shows a graphic based on that 2013 study, comparing cat kills with other bird threats, showing cats kill four times as many birds as the next biggest threat — building strikes — and more than eight times as many as automobiles. Feral cat lovers question the study's numbers. One reason is that it depends on estimates of outdoor cat populations in the United States. But nobody has tried to count them, at least not on this level. "We're making wild guesses as to, are there 1,000 cats out there, 10,000, 100,000?" says Bill McShea, with the Smithsonian Conservation Biology Institute, one of the lead researchers working on the cat count. "So we set up a project to try and count the cats in a typical city, Washington, D.C."
He says the data will inform the debate about cats and birds, and it will be a model other cities can adopt, making possible data-driven cat management. McShea says working together on the project is helping both sides actually trust each other. "It's like a lot of things on the Internet. You're arguing back and forth with people you don't know. In this case we've met, we've worked toward this thing slowly and we all trust each other." Lauren Lipsey with the Humane Rescue Alliance agrees it has been a trust-building process. She says her organization will use the data to evaluate how effective D.C.'s trap-neuter-return program is. For the past decade, D.C. has been managing feral cats not by euthanizing them, but by spaying or neutering them, then releasing them back into the city. The idea is that over time this population of sterilized cats will dwindle and disappear. To know if that's actually happening, you need an accurate cat census. Think counting cats is easy? Nope. The census started in September, beginning with the easiest areas to survey: public parks. "In a forest you can get permission for the whole forest and you can put a camera anywhere," says Herrera, the field technician. "But in an urban area you're bound to where people are OK with you putting a camera. Then even within a yard sometimes people want you to only put it facing a certain direction." So far, the team has collected more than 40,000 photos, mostly from Rock Creek Park: foxes, coyotes, deer, squirrels, raccoons, people walking dogs. But so far, they've only captured one cat photo — black and white, a large well-fed feline slinking through the woods. "I was expecting to find a little bit more in these natural areas," says technician Mike Cove. It's way too early in this three-year study to draw any conclusions. But Cove says the possible paucity (er, paw-city?) of cats in the park may have to do with another predator — coyotes. He cites a study from 2015 called "Cats Are Rare Where Coyotes Roam," which found that cats are 300 times more abundant in urban, coyote-free neighborhoods compared to coyote-filled parklands. Herding cats - difficult. So how about counting cats? Researchers in Washington, D.C., have just begun work on a three-year, $1.5 million cat census to get a definitive count of how many cats there are in the city. But why do we even need a cat count? Jacob Fenston from member station WAMU has the answer. 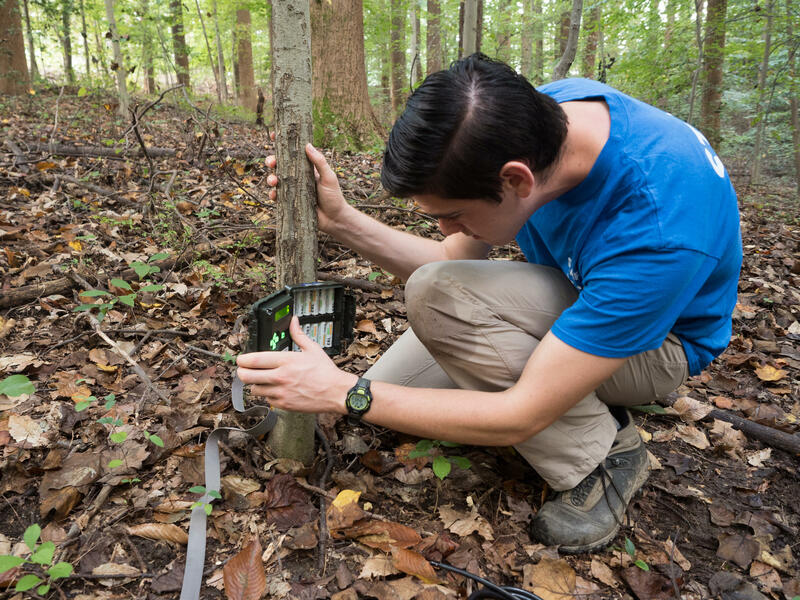 JACOB FENSTON, BYLINE: Justin Belsley is checking his GPS, navigating a densely forested part of Rock Creek Park right in the middle of Washington, D.C.
BELSLEY: It is southwest, so I guess we should take this trail. UNIDENTIFIED PERSON #1: All right. FENSTON: Belsley is a field technician working on the D.C. Cat Count. He and Mike Cove are tracking outdoor cats - strays, ferals and pets - using the same methods scientists use to study much larger animals. MIKE COVE: Tiger researchers have been doing this for two decades. FENSTON: Setting up wildlife cameras, taking thousands of photos and using the photos to identify individual animals based on their markings. COVE: We're doing the same thing. We're just working with much smaller tigers. BELSLEY: I have fed a colony of feral cats myself for about three years now, and I just love cats. FENSTON: For decades, there's been a passionate, often overheated debate amongst humans who love animals. It pits cat lovers, who want to help feral cats survive in the wild, against bird lovers, who say cats are causing bird populations to plummet. Dan Herrera is also working on the cat count. DAN HERRERA: This project has kind of stoked the fire a little bit. It's, like, people who proclaim to be team cat and team bird. HERRERA: We are team science. FENSTON: It's a sort of truce. FENSTON: To understand why the cat-bird debate is so heated, I head out on a bird walk with the DC Audubon Society. DANA MCCOSKEY: So we have one of the first birds today - blue jay. FENSTON: Dana McCoskey is one of the walk leaders. At one point between bird sightings, conversation turns to the threats facing native and migratory birds. FENSTON: McCoskey cites a 2013 study that found cats kill as many as 4 billion birds a year in the contiguous United States. But nobody knows how many cats are doing the killing. BILL MCSHEA: Are there 1,000 cats out there, 10,000, 100,000? FENSTON: The Smithsonian's Bill McShea, one of the lead researchers working on the cat count. For the past decade, D.C. has been neutering feral cats, then releasing them back into the city. The idea is that, over time, this population of sterilized cats will dwindle and disappear. Another reason we need a cat count - to see if that's actually happening. COVE: Where do we cross? HERRERA: So the bridge is that way. COVE: Oh, it is that way. FENSTON: Back in Rock Creek Park, the field technicians are heading to their next camera location. HERRERA: I'm always really quick to show these off. FENSTON: Dan Herrera pulls out his cellphone. HERRERA: This is my little best-of collection - adorable, little fox there. HERRERA: There's a coyote. Yeah, a red fox. FENSTON: In just a few weeks since they've started, they've gotten more than 40,000 images - foxes, coyotes, people walking dogs - but so far, only one cat photo - black and white, a large, well-fed feline slinking through the woods. It's way too early to draw any conclusions. Maybe the growing coyote population is keeping cats out of the wilder parts of the city, thereby protecting native birds. Or maybe D.C. cats are just extra-stealthy. For NPR News, I'm Jacob Fenston. Transcript provided by NPR, Copyright NPR.